In their first year, fresh-faced students in the Department of Theatre study the Governor General's Award-winning play, Unity (1918). They perform scenes and monologues. They dream up design ideas and consider directing approaches. They also learn about its author Kevin Kerr, one of Canada’s most innovative playwrights and a founding member of Electric Company Theatre. Last year, when Kerr took up a post as a faculty member in the Department of Writing, the Phoenix asked if he would direct his Unity. He agreed, and as it turns out, this is his first time ever directing this play! Everyone has been incredibly excited to be part of this much-loved play, especially graduating students who, as they work on their final project at the Phoenix, find themselves coming full circle – honoured to work under the direction of the very man who wrote the play they fell in love with when they arrived. And now, we are honoured to share this touching, funny and profoundly important play with you. Behind the Scenes: Finding unity in Unity. This summer will mark one hundred years since the beginning of the First World War. Four years later, in 1918, the war was over and soldiers were returning home, but a new enemy showed its face in countries all over the world: the Spanish Flu. 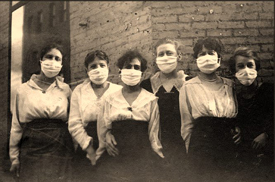 Despite many prophesied doomsdays, no pandemic in the last century has swept the world with such rapid ferocity and mysteriousness as did the Spanish Flu. It infected 500 million people around the globe, killing between 3-5% of the world’s population: over fifty million people in one year alone. 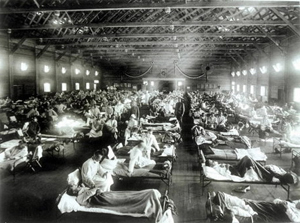 Despite the staggering numbers – over three times the number of deaths from World War One – history seems to have forgotten the terrifying impact of the Spanish Flu. As the Great War came to an end and soldiers returned to their families, Canadians thought life was about to go back to normal. Instead, the country was hit by an invisible enemy. The flu didn't target those typically vulnerable to disease: the group hardest hit were the young, people in their prime. Young soldiers who had managed to survive the war came back to another – much more deadly – battle. Trench lines were no longer muddy pits, but sick beds. Soldiers didn’t carry guns, but lay sick and sweating while the new warriors wore fabric masks and daubed sweaty heads. Women weren’t knitting socks to send to their loved ones off in a distant, unknown land; they were on the front lines, and they stood up to the challenge. In this CBC report Surviving 'The Spanish Lady' (shown right), survivors of the Flu recount their memories of towns being quarantined and refusing to allow trains to stop at local stations, and how day-to-day life was completely altered by the disease. Tens of thousands of Canadians were affected by the Spanish Flu, and their stories are a powerful reminder of a devastating moment in our country’s history. Unity (1918) shows the strength we can find in community and our deep desire to be connected. UVic's The Ring interviewed Kerr about directing Unity (1918) for the first time. 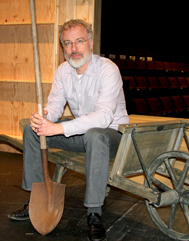 Read Kevin Kerr's full bio as a playwright, director and faculty member in the Dept. of Writing. Kerr's work at the Electric Company Theatre in Vancouver. Western Front Pacific Coast Branch is an association that aims to further educate the period between 1914-1918 during the First World War, and to perpetuate the memory, courage, and comradeship of those of all sides. UVic's "A City Goes to War" website on events in Victoria and in the world during WWI. Canadian War Museum website on WWI with history, photos, teacher resources and more information on Spanish Flu. 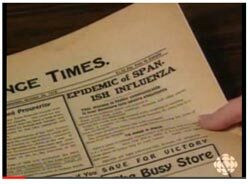 Effects of Spanish Flu in Saskatchewan. Told through the pages of one young woman's diary, this 2002 Governor General's Award-winning play is a touching and darkly comic portrayal of a forgotten chapter in Canadian history. During the final few weeks of World War I, the global Spanish Flu pandemic spread across the country and the entire town of Unity, Saskatchewan, is under siege from an invisible enemy. Relationships between the townsfolk are tested as they continue to try to embrace life at the edge of death. Join Kevin Kerr as he talks about revisiting Unity (1918) for the first time as a director. Having written the play over a decade ago, Kerr will discuss the differences in approaching one of his works as a director rather than a playwright. 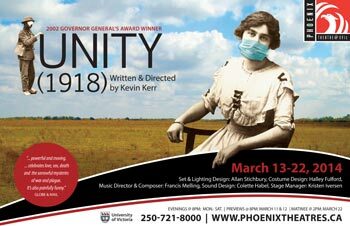 Join Monica Prendergast after Tuesday's show as she interviews the director and cast of Unity (1918). The Department of Theatre is hosting dance theatre performer Michael Sakamoto as part of our exchange program with Bangkok, Thailand. He will be performing two works, Gherm a dance theatre solo and Flash Mixtape, a duet with Waewdao Sirisook. The lighting designs for these works were created by student Imogen Wilson who, with other student Breanna Wise, is currently studying at the Bangkok University's Production and Design program. Internationally renowned lighting designer Michael Whitfield (BA’67) was honoured by UVic in February with the Distinguished Alumni Award for his lifetime achievements. Michael, one of our very first graduates in theatre, recently retired from his illustrious position at the Stratford Festival as the Resident Lighting Designer. 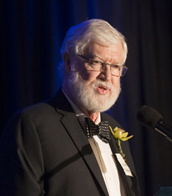 He returned to the West Coast and his Alma Mater last year to instruct our Phoenix students. Congratulations Michael! Comedy duo Peter Carlone (BFA'08) and Chris Wilson (BFA'08) - otherwise known as Peter N' Chris - are at it again with a new webseries on Youtube called Hardly Men. They released their first sneak peak and trailer on March 3 and will be releasing episodes in the near future! In the meantime, they're also going to be a featured act at the Toronto Sketch Comedy Festival with their latest show, Peter N' Chris and the Kinda OK Corral, alongside acts like The Kids in the Hall! Best of luck, guys! 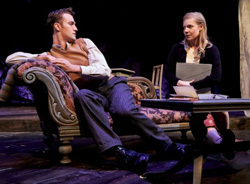 Blue Bridge’s The Glass Menagerie received fantastic reviews and a hold over! We’re proud of all the Phoenixers involved, with Victor Dolhai (BFA’07), Sarah Pelzer (BFA’09) and Matthew Coulson (BFA’10) in the cast and Patricia Reilly (BFA’11), Bryan Kenney (MFA’12), professor emeritus Giles Hogya, and professor Brian Richmond on the creative team. 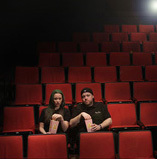 Coming up next at Blue Bridge's Roxy Theatre, Chelsea Haberlin (BFA'07), Sebastien Archibald (BFA'07) and Colby Wilson (BFA’07) of ITSAZOO Productions will be presenting their production of Annie Baker's play The Flick from March 18-30. The show, about one if the last 35mm film projector movie houses, will be featuring alumna Kate Richard (BFA'06) (shown below right). The perfect play for the Roxy! February was a busy month for Phoenixers, with Jeff Leard (BFA’10) performing his one-man show The Show Must Go On at Intrepid Theatre. His father James Leard (BFA'70), the Artistic Director of Story Theatre, has been busy with developing a pre-pilot for a TV series called The Happy Valley Hockey Association. They're working on funding for a pilot (and maybe more!) and you can help by watching the trailer on YouTube and giving it a like! Kerploding Theatre's production WordPLAY was put on at Intrepid Theatre's The You Show series on March 1. Directed by current student Mollison Farmer and featuring Phoenixers Kaeden Derksen, Colette Habel and Kathleen O'Reilly, this show entertained and inspired young audiences while raising funds for our Applied Theatre department's trip to Tamal Nadu, India in the fall. Remember to check out past Phoenix Phacts and alumni profiles on our website. Alumni! We want to hear more about YOU! Fill out this quick theatre alumni survey and tell us what you've been up to and you could be in our next Phoenix Phacts. 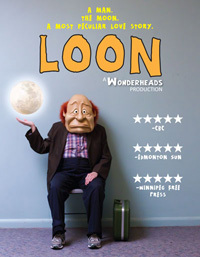 WONDERHEADS last appeared in Victoria at Intrepid Theatre's Winterlab 2013. What was the name of this deathly comedy in full face mask? Correct answers will be entered into a draw for a pair of tickets! Email your answer before March 17 at Noon to win!